In the spring of 1906 in Kentucky, Wes Wilson stands in his freshly plowed field gazing at furrows that will soon be filled with young dark-leaf tobacco plants. This crop is his life's blood, the product that allows him to feed and clothe his family. Wes is determined that nothing-not the powerful monopoly trying to drive prices down, or the growers' association demanding that farmers hold back their crops-will stand in his way. But the secrets and lies which plague the community smother Wes as he struggles to decide whether he should join the Association or sell out to the tobacco company. In the days that follow, Wes realizes that he's a threat to his family's peace. So, like the Night Riders who wear masks to hide their identity, he puts on a mask of control to hide his troubled mind. Wes is blind to the dangers he faces-the devious tobacco buyer; the ever-present Night Riders; and the cousin who is hiding a deadly secret- grow more intense the longer he takes to decide what to do with his crop. The conflict erupts and soon rages out of control with a result both surprising and tragic. 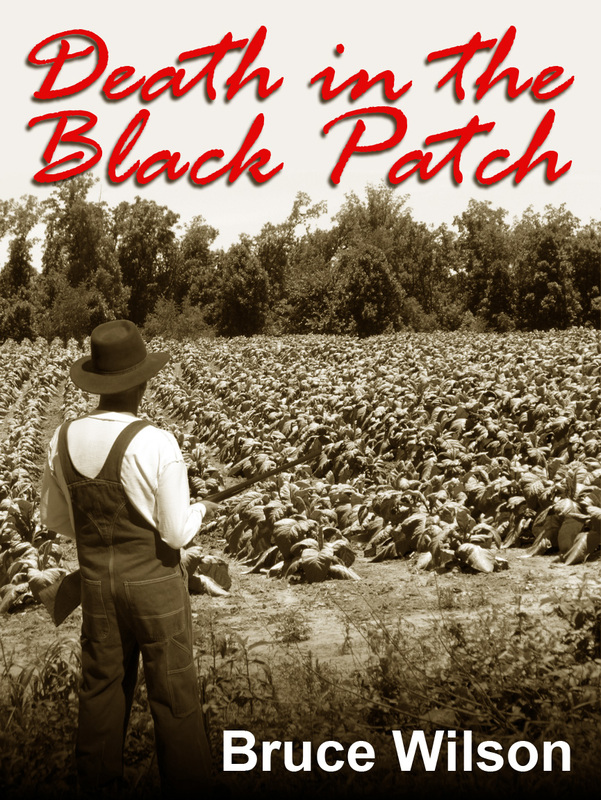 Death in the Black Patch is now available as a downloadable e-book from Amazon Kindle. Download a copy of Death in the Black Patch for only $3.99! Here's an article in the Western New Mexico University paper The Mustang about Bruce's first novel. Bruce Wilson's story has a long reach … his story is your story and my story. It is fundamentally our story. How he came to tell it, innocently enough, was a result of his desire to see the place where his grandparents were born and lived at the turn of the century in southern, tobacco-growing country in the United States. First, a chance meeting, then another, next an archived microfilm front- page story from the Lynnville Daily Messenger, May 21, 1906. Then, a story of people's lives that reminds us of a shared history, who we all are, across time and geography. Note: Wilson is a teacher of history - able to take in a depth of detail in the construct of a big picture, requiring a deep interest in sequence, relationships of when and how things come to be. And, Wilson is an actor - bringing that history-seeking mind and attention- to-detail to life, finding the key to character and uncovering and revealing people. And, thank you very much! Here before us, there we all are. The Black Patch Tobacco Wars of 1904-1909 are a quintessential example of North American industrialization - money and power bringing high stakes for everyone as monopolies rose and life and death hung on the line every day in a country of free men and an economy up for grabs. The circumstances of this era and how it played out is truly gripping. The American Tobacco Company, one of the largest monopolies in U.S. history, versus a grassroots Tobacco Planter's Protective Association is an iconic U.S. tale. But the over-reaching tale of these players is also a backdrop, in this story of us, for Wilson to bring his family members to life with all their joys and sorrows, strengths and weaknesses, personalities and relationships. With no adequate answer to be had and bad results either way, the question to sell your tobacco or not, hold out with the Association for a strength in numbers affect, or sell for less than the cost of your crop is a life and death one. Big business, unions, scabs, underlying racism - it is a frightful story. How quickly we can become "other" when product and money are the carrot. This societal war brought Night Riders and Hillbillies into conflict, farm burnings, shootings and hangings, real havoc between farmers and ultimately between family members. Art hated himself for avoiding Wes's question and not giving him the names. It was the first time he'd ever lied to Wes or held anything back from him, and it gave him a knot in his guts. But he had to protect himself and his own family and thought that this was the only way. Wes Wilson, Bruce Wilson's great grandfather, played a role on the big stage of Black Patch history along with his wife Zora and their children, Wes' brother Mark and cousin Art. Wilson brings his family back to life to become key players in detailed tableaus of their society, family units, hardships of farming, and coping in a dangerous world. These scenes have the depth of screen play, the dialog of personal relationships and belief systems. Anthie and Sudie, Wilson's Grandparents, rise from similar family circumstances in the midst of the Black Patch turmoil. They court, marry, raise children and thrive into the 1960s. For Bruce Wilson, his family's mysterious and historical story germinated in his mind for eight years until influences in 2014 brought him to the decision to tell that story. If only his ancestors could know that grandson Bruce found his way to evidence of their personal story and their place in history, writing it for them, and reminding us that we all live in one patch or the other, with a complicated stake in a big human picture.